The White Sewing Machine Company of Cleveland built about 8,000 steam cars from 1901 through 1910. White steam cars differed greatly from Stanleys. More sophisticated and complicated, with a coil boiler and compound engine, they had condensers (to recycle the water) starting in 1903. 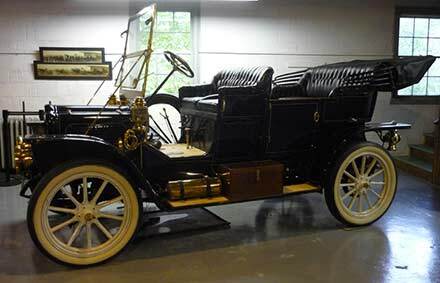 White manufactured two sizes: the smaller 20-horsepower cars (like this one) and the huge 30-horsepower models (later termed 40-horsepower) that cost twice as much. Although Stanleys remain better known today, more Whites were sold during the 10-year period when both were produced. The late Harm and Betty Andrews of Warren, Ohio, were beloved by the steam car community and attended steam car tours for many years. This beautiful White steam car from Harm’s collection is on loan to the Friends of Auburn Heights Preserve by the Andrews children in memory of their parents. We thank Mike May for arranging the loan.